Date Day | Teefa Says..
It’s been weeks since Mr. Chenta and I last had our real date. He’s busy with school (midterms, quizzes, assignments) on weekdays and on the last 3 weekends, he’s busy spending it with his best friend who’s home from London. Being the understanding girlfriend that I am (ahem), I let him be a guy and do all the guy stuff with Faiz while Faiz is still here. I know how much he misses his best friend when Faiz is abroad. Besides, I can spend time with my friends and doing me-things. But it’s been more than 3 weeks and I miss my boyfriend. Yes, we see each other most days but even then we’re busy doing our stuff or run errands. I want a real date. So I scheduled a no-one-can-disturb date. Just the two of us. A traditional dinner-and-movie date. Yayy! We went to the Curve. We were starving.. Tummy-first is always our policy. Hehe.. I was craving for their Stuffed Mushroom for weeks but didn’t have the time to get around to it. Now I can have my revenge! We ordered Stuffed Mushroom for starter, and Chicken Parmag-something to share as Italiannies’ portions are always big. As always, the Stuffed Mushroom is ravishing.. It’s a plate of 8 heavily-stuffed-with-delicious-things mushrooms, that were surrounded by cheese. *drool* I practically asked for a second serving of it *drool* (but stopped when I did calorie counting..damn calories!). Came our main dish. It’s spaghetti drenched in tomato sauce with two chicken patties on top. The taste is as disappointing as the way it looks (sobs). Now I know for sure that I can’t really trust Italiannies’ pastas. Lesson learnt: next time we’ll have dinner elsewhere and come to Italiannies for the Stuffed Mushroom only. i can taste it in my mouth just by looking at this. Daiso - the 5 Ringgit stuff store!! 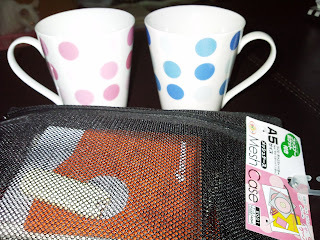 His and Hers mugs and his mesh pencil case! Happy with these cheap purchases, we made our way to Cineleisure to watch PAPADOM. At last! I’ve been wanting to watch this for a long time… Yes, saya agak terlambat dan ketinggalan. Hehe.. Since most people have already watched this, there’s no need for me to elaborate on the movie. Yes, it is an insanely-funny-but-deeply-touching movie. Well done, Afdlin Shauki! There goes our date. Short and sweet and I love every moment of it.